Once again the Spurs struggled against a lottery-bound team, but this time they got the win thanks to their second unit. At least they won. That’s the only positive to take away from the Spurs’ 108-107 victory over the Bulls in Chicago. With how tough it’s been for San Antonio to beat bad opponents, it’s good that they actually escaped with the W, even if it was frustrating that they had to suffer so much for it, mostly due to the poor play of their most important players. Facing a terrible defense filled with young guys who don’t know how to execute their game plan as a team, you’d think the Spurs would try to wear it down by moving the ball smartly and showing patience. You’d be wrong. On the first three quarters the starters settled for bad shots after minimal movement. They made life easy for a Bulls squad which, despite being collectively disastrous at stopping opponents, has enough passable individual defenders to contest the type of tough looks San Antonio was all too happy to launch after several seconds of inaction. On the other end, the Spurs didn’t really have to worry about a system. Chicago doesn’t have a smart offense that creates good looks for them, despite this being Fred Hoiberg’s fourth season at the helm. They do have players that can score if allowed the freedom to do so. The best way to stop them is to be aggressive denying them the ball and making sure their looks aren’t comfortable. Yet the starters played with zero energy, simply going through the motions while relying on teammates to bail them out. The Bulls’ scorers feasted on those lightly contested shots. None of the starters finished with a positive plus/minus. The Spurs would have lost this game had Pop played his normal rotation. Fortunately, he turned to his bench which, once again, gave San Antonio an opportunity to win the game. Movement and energy is really all it took to outplay these Bulls. Instead of standing around, the bench players cut and drove with purpose, exposing huge cracks on the defense and making the extra pass. They used misdirection and the threat of their shooters to force Chicago into tough decisions. On the other end they kept their arms raised and took pride on stopping their assignment. Even on mismatches, they fought. They were the only reason the Spurs were in it going into the fourth quarter, where the stars got a chance to shine after largely disappointing. Aldridge and DeRozan took over late. They played with the type of aggressiveness on offense that they lacked for the previous three periods. They combined for 18 points, first trading buckets with a red-hot Zach LaVine and then creating a seven-point lead with a little over two minutes to go. The Bulls eventually cut it to one and had the chance to win the game after stealing an inbound pass with three seconds to go, because the basketball gods wanted to remind the Spurs they didn’t deserve to win this one. Fortunately, former Spur Ryan Arcidiacono’s would-be game-winner was short. I’d love to say that the Spurs will surely learn from this game and will be ready the next time they face a bad team, but I’m not sure they will. It’s not like they’ve lacked opportunities to learn this particular lesson. For some reason, they seem unable to. As long as they somehow win like they did against the Bulls, however, I won’t complain too much. The Spurs are now 9-0 in games in which LaMarcus Aldridge scores at least 20 points. Aldridge was one of the main culprits in the offensive stagnation the starters suffered for long stretches, as he settled for bad looks and asked for the ball in the post only to then struggle with the inevitable double team. His great play in the fourth quarter, however, should be noted. Aggressive LaMarcus is the best LaMarcus, and he showed up when he was most needed. DeMar DeRozan spoiled us with his early play this year. That’s the only explanation for me thinking he had a bad game despite finishing with 21 points, eight rebounds an five assists and looking great in the fourth quarter. I just can’t shake the memories of bad defensive plays and unnecessary jumpers. Even if it actually was a bad game, it would be one of the few he’s had this season, so he’s forgiven. Beyond just playing the bench more, Pop experimented with the rotation. He took Rudy Gay out early in the first quarter for Derrick White and only played him 17 minutes total for the night and just four seconds in the fourth quarter. Hopefully the low minutes have nothing to do with Gay’s health. White did the most with the opportunity to play more. He made some mistakes — slow down, dude! — but also made some plays on defense and canned a couple of three-pointers, including a big one to give the Spurs the lead with 4:11 left in the game. He’s starting to rediscover his game. 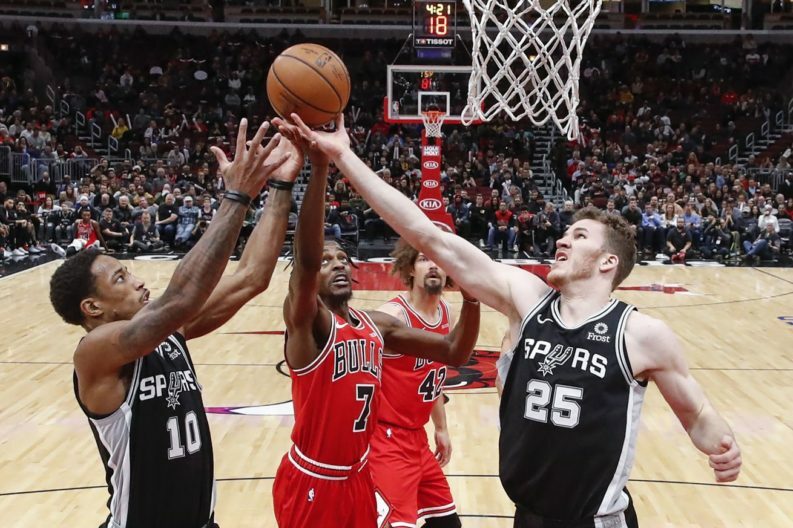 Davis Bertans and Marco Belinelli couldn’t buy a three-pointer. They combined to go 1-for-11 despite getting some good looks, but were still instrumental in keeping the Spurs in the game. Marco had five assists, breaking down the defense with his off ball movement, then finding the open man. Davis, meanwhile, was really good on defense both individually and at the team level. These two can do more than shoot. The Spurs didn’t need three-pointers from Marco and Davis because Patty Mills and Bryn Forbes provided them. The two combined for five threes and were a threat the Bulls had to deal with as soon as they touched the ball. While we are in the topic of shooting, where does Bryn’s shot rank in the league in terms of beauty? It has to be up there, right? The form is so pure. Off the top of my head, I’d only take Klay Thompson’s over it. Jakob Poeltl continues to improve from game to game. Against the Bulls he had 10 points, four rebounds and four assists. He’ll never be an exciting performer — only Dante Cunningham is more boring to watch and discuss in the entire roster — But Jakob is starting to show his value. The Wolves have won six of their eight games since trading Jimmy Butler, so it might be tough for the Spurs to end their four-game road trip 3-1.